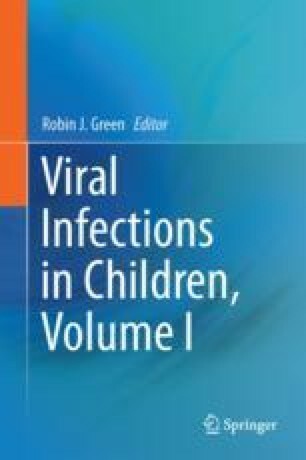 This chapter is on the human immunodeficiency virus (HIV) and the specific effects of the virus on children. The field of HIV is a rapidly changing one as new research reveals new information in many aspects including the pathogenesis, prevention and in the field of antiretroviral therapy. This chapter strives to provide the latest updates. The first part deals with the epidemiology, the structure and life cycle of the virus, the immunopathogenesis, modes of transmission and prevention thereof, and making the diagnosis of HIV in children. This is followed by the natural history of HIV infection, classification of HIV infection and immune status, and the clinical manifestations of the disease. The next section covers general management and antiretroviral therapy of the HIV-infected child and adolescent. The final section covers prevention including prevention of mother to child transmission and vaccines. In the field of paediatric antiretroviral therapy (ART), there are continually changing guidelines, as new formulations and new drugs and new fixed-dose combinations become available. It is recommended that readers refer to the WHO and national guidelines for the latest guidelines. UNAIDS. 4th Annual Report of the Global Plan. 2015 Progress Report on the Global Plan. http://www.unaids.org/en/resources/documents/2015/JC2774_2015ProgressReport_GlobalPlan. Accessed on 21 Sept 2016. UNAIDS. Global AIDS Response Progress Reporting (GARPR). Global AIDS update, 2016. http://www.unaids.org/sites/default/files/media_asset/global-AIDS-update-2016_en.pdf. Accessed 21 Sept 2016. World Health Organisation. Consolidated guidelines on HIV prevention, diagnosis, treatment and care for key populations. 2016 update. http://www.who.int/nutrition/publications/hivaids/9789241597524/en/. Accessed 21 Sept 2016. World Health Organisation. Consolidated guidelines on the use of antiretroviral drugs for treating and preventing HIV infection. http://www.who.int/hiv/pub/arv/arv-2016/en/. Accessed 21 Sept 2016. World Health Organisation. Consolidated guidelines on the use of antiretroviral drugs for treating and preventing HIV infection—recommendations for a Public Health Approach. 2nd ed. 2016. http://www.who.int/hiv/pub/arv/arv-2016/en/. Accessed 23 Sept 2016. World Health Organisation. Elimination of mother-to-child transmission (EMTCT) of HIV and syphilis. June 2016. http://www.wpro.who.int/regional_director/regional_directors_report/2016/media/2016_01_dcd_05_hsi.pdf?ua=1. Accessed 29 Sept 2016. World Health Organisation. Guidelines for an integrated approach to nutritional care of HIV-infected children (6 month-14 years). http://www.who.int/nutrition/publications/hivaids/9789241597524/en/. Accessed 21 Sept 2016. World Health Organisation. Pediatric advocacy. Toolkit: for improved pediatric HIV diagnosis, care and treatment in high HIV prevalence countries and regions. December 2011. http://www.who.int/hiv/pub/pediatric_toolkit2011/en/. Accessed 21 Sept 2016. World Health Organisation. Management of severe malnutrition: a manual for physicians and other senior health workers. 1999. Available at. http://apps.who.int/iris/bitstream/10665/41999/1/a57361.pdf Accessed on 03 March 2017. Department of Health, RSA. HIV guidelines. National consolidated guidelines for the prevention of mother-to-child transmission of HIV (PMTCT) and the management of HIV in children, adolescents and adults. 24 December 2014. http://www.kznhealth.gov.za/family/HIV-Guidelines-Jan2015.pdf. Accessed 21 Sept 2016. Guidelines for the use of antiretroviral agents in pediatric HIV infection. https://aidsinfo.nih.gov/guidelines/html/2/pediatric-arv-guidelines/0. Accessed 23 Sept 2016. Joint United Nations Programme on HIV/AIDS (UNAIDS). 90-90-90 an ambitious treatment target to help end the AIDS epidemic. October 2014. http://www.unaids.org/sites/default/files/media_asset/90-90-90_en_0.pdf. Accessed 29 Sept 2016. Panel on Antiretroviral Therapy and Medical Management of HIV-Infected Children. Guidelines for the use of antiretroviral agents in pediatric HIV infection. https://aidsinfo.nih.gov/contentfiles/lvguidelines/pediatricguidelines.pdf. Accessed 22 Sept 2016. Panel on Treatment of HIV-Infected Pregnant Women and Prevention of Perinatal Transmission. Recommendations for use of antiretroviral drugs in pregnant HIV-1-infected women for maternal health and interventions to reduce perinatal HIV transmission in the United States. https://aidsinfo.nih.gov/contentfiles/lvguidelines/PerinatalGL.pdf. Accessed 22 Sept 2016.